Okay, is it just me, or is there a fig craze afoot? From fig vinegars and fig chutneys to fig spreads and fig jams, I seem to be encountering figs everywhere I turn. Just yesterday I noticed pint baskets of fresh figs at my local supermarket. And last month, while driving to the beach in North Carolina, I stopped at Morris Farm Market and what was the first thing I spotted? A gorgeous display of fresh figs! I bought a quart and we enjoyed experimenting with them over the next few days…we tried them grilled on pizza, drizzled with olive oil and added to arugula salad, and we even invented a bittersweet chocolate & fig dessert sauce that we poured over vanilla ice cream. Today, I was walking along Canal Street in Chinatown and there among the dried lychees and live crabs were, yes, pints of fresh figs, at the very reasonable price of two for $3! So, in the spirit of fig-mania, we present Cathy’s latest fig concoction. And if you have a favorite fig recipe, please share it! – In large skillet, heat butter over medium heat until lightly browned. Add onions; cook and stir until browned. Remove onions from skillet. To skillet, add figs, walnuts, salt and pepper; cook until figs just start to soften. Remove skillet from heat. -Meanwhile, cook tortelloni according to package directions, draining and reserving 2 Tbs. pasta water. – To skillet, add tortelloni, reserved pasta water, cooked onions, goat cheese and basil; cook over low heat just until cheese melts. Serve immediately. 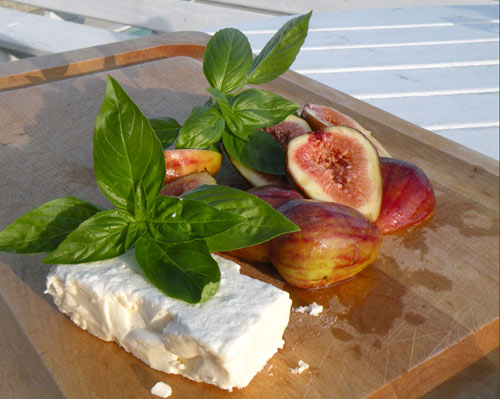 Use fresh figs within a day or so after buying them as they are very fragile! So many varieties of potatoes to choose from. Do they all taste the same? Can they be used interchangeably? Does the color dictate the flavor? 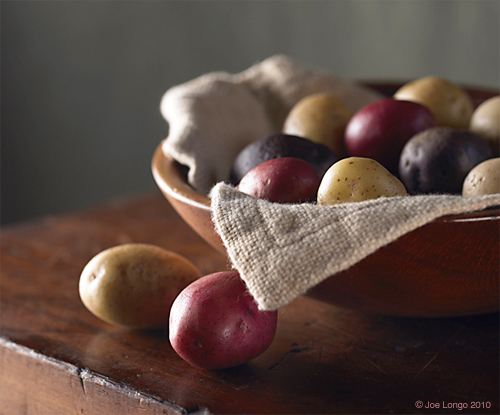 I am going to talk about the three little “spuds” in our photo below… Red, Yellow, Purple. All three are popular, red and yellow variety leading the pack. The red, also known as a “new potato”, because it is harvested before it reaches maturity – white flesh, available all year-round. The yellow, commonly known as “Yukon Gold.” – yellow flesh, also available all year-round. The purple, also known as blue – purply blue flesh, mostly available in the fall. All three varieties produce a moist, creamy texture. All are pretty versatile and can be used for boiling, steaming, roasting, baking, mashing. I am going to share a fantastic potato recipe that I styled for a wonderful magazine, that unfortunately has folded… Kitchen Garden Magazine, published by Taunton Press. I remember distinctly shooting the story in an antique farmhouse in Washington, CT. The house was beautiful. The kitchen full of “old-time” charm. The recipe: Roasted Potatoes with Fresh Sage. The sage leaves are placed on the bottom of a heavy skillet (cast iron is best). The halved potatoes go on top of the sage leaves, then roasted in the oven. The sage gets so crispy, and the flavor — incredible! You can certainly try it with any of the potato varieties discussed above. Whatever color suits your fancy for the day!!! – Preheat oven to 425F. Pour oil into heavy oven-proof skillet (preferably cast iron), tipping skillet so oil covers bottom of pan. Lay sage leaves flat over oil, completely covering bottom of pan. -Sprinkle salt over sage. Arrange potatoes, cut side down on sage. Bake, uncovered until potatoes are tender and the cut sides are crusty brown, about 35 minutes. It’s Wednesday and I promised to have the recipe for the White Balsamic Vinaigrette. Well, here it is. is milder and less sweet than regular balsamic. enhances the flavor but it also adds body. a jar with a tight fitting lid then shake away!!! 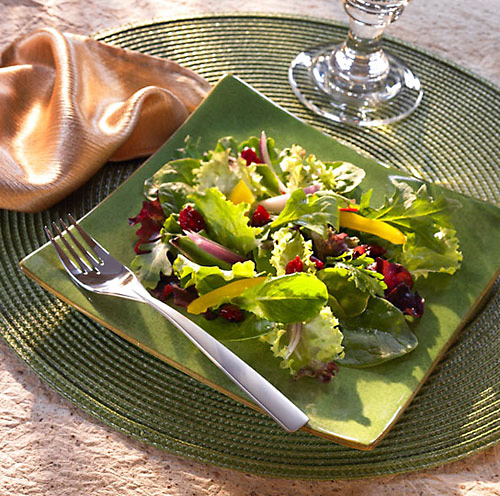 – Substitute your favorite fresh herb for the rosemary. beast in olive oil until mixture thickens slightly.